It’s Spring. And with Spring comes gardening and my annual re-assmembly of the patio furniture and the gardening tools and accessories. My garden hose in the backyard, along with the wall mounted hose rack, needed replacing – evidenced by water leaking from every joint and then the old hose actually bursting. The first attempt at using it this spring resulted in more water on me than on the flowers. This story is about all that. It should be simple. But, I have this obsessive compulsion about getting the hose assembly and sprayer to work without leaking. This just seems like something that should be possible. I started with the wall mounted rack. You should get one that is double-coated steel with brass fittings, which won’t crack over time as easily. The installation here was pretty straight-forward, although the screws they provided are not appropriate for installation against a brick wall. The Tapscon screws are the best for this kind of installation, and the 1 3/4″ depth with the hex head worked super. With this product you need to use the template and watch the placement of where the screws will line-up on the brick – they are not an exact multiple of the standard brick height, if you are mounting against a brick wall (you don’t want to screw into the mortar). In my first attempt at getting the back-yard hoses up-and-running, I went with the Troy Bilt 50-FT 5/8-IN Heavy Duty Contractor Hose. It looked sturdy and it had all the right words in the product title: heavy, duty, contractor, hose and this idea that it was “bilt” with some kind of quality. No, no, no. Avoid this product. My main problem was not with the hose, but rather the leaking at the male fitting end. When dealing with leaks, there is always some idea rolling-around in your head that you just didn’t put it together right. After several attempts at different gaskets, plumbers tape, reaming the heck on the fitting to get it tight, there was still a leak at the male fitting end. The design doesn’t seem to be that great because the leak occurs between the threaded head-end and the brass portion on the hose, no matter what kind of gasket type or size I used. This wasted a whole morning and practically drove me insane. This is the kind of stuff that makes me angry-enough to write a stupid blog about it – damn that hose! 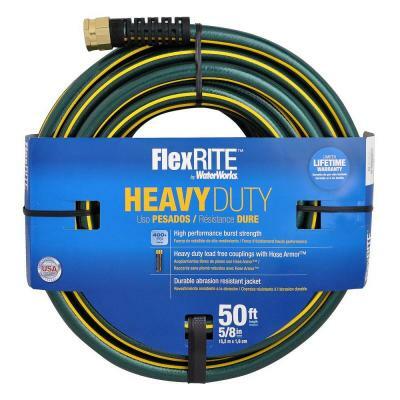 My second attempt was the Waterworks 5/8″ FlexRITE Heavy Duty water hose. Remember, it’s important to buy products that have the words “heavy duty” in them, so we can re-enforce the idea that marketing people can use their psychology degrees to help their clients charge a premium for products. Of course, I bought the heavy duty hose. This worked out a lot better. The fitting had better construction although I did replace the standard gasket with another one that was a bit more snug against the thread of the fittings. Success! On a related note, I do recommend Gardena gardening tools and attachments for your hose – my “go-to” for the back-yard is the Gardena Multi-Function Spray Lance. I have never had a problem with Gardena adapters and products leaking. However, you need to remember to not leave them outside during the winter. Avoid leaks, and raging from fury, in the back-yard. The Bottom-Line: Say “no” to Troy Bilt hoses and “yes” to Waterworks FlexRITE hoses, and invest in a better hose with a decent fitting to avoid leaks; a solid steel hose rack with brass fittings is also a must. ← The Porsche of Steam Irons: Rowenta Eco-Intelligent. Vroom.